which should be of interest to all new Peppermint users. 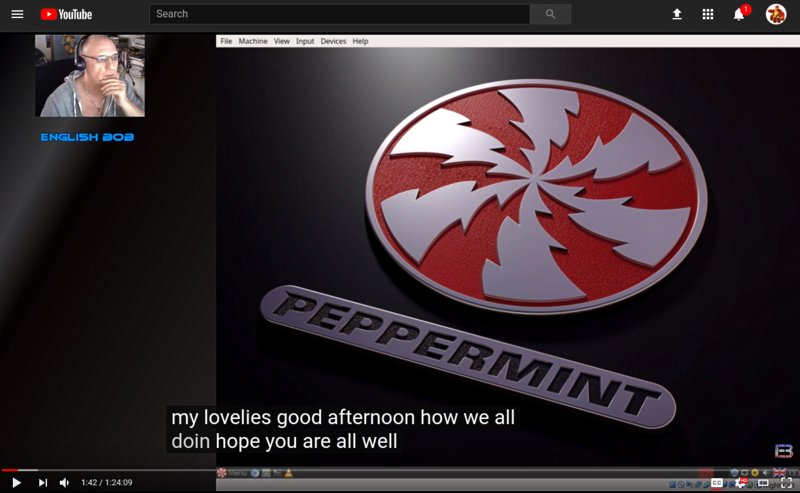 Also more exposure for Peppermint and, as pointed out in video, Distrowatch ratings mean nothing in terms of actual quantity of users for a particular distro. His "Static" Masterclass on Peppermint is better. Less chance of him making mistakes and a VM is never the best place to demo stuff IMHO. Yes I agree his static Master Class videos are a quicker watch but I think you can also learn from the live stream comments (including yours!) and even the "mistakes". He is doing a second live stream in the series tomorrow. Agreed VM install not as good as bare metal. I can't understand much of what he says. You'd think that with a name like English Bob he'd speak English.........Haaaaaaaaaaaaaa! Go USA. I guess the big problem is my aging ears....can't pick up on unfamiliar sounds (or is that my aging mind?). What really bugs me is that I can't even understand British print. Ha! Is it the use of "S's" instead of "Zed's" and the colours ? I learned to use Closed Caption(ing) AKA 'CC' when watching UK movies, TV series, and so forth. Part of it is your idioms. Even if we understand them - we don't know what they mean. Bwahahahaha! Remember me telling you that I got a 1-month 'timeout' in the Ubu Forums, for calling someone a toilet hugger?